This addictive snack is a simple Southern favorite! In one word, this recipe is ridiculous. It should NOT be as insanely delicious and addicting as it is. I mean, they're saltine crackers for heaven's sake! 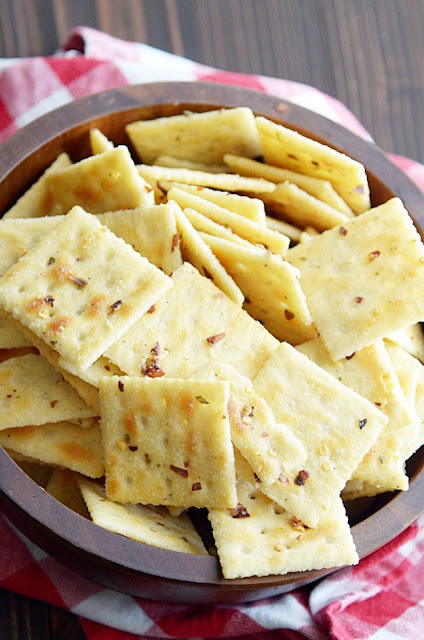 How good can you really make saltine crackers?! My grandmother makes these crackers, and every time we go to her house I hope to find a big container of them waiting me for m on the counter. They're classically Southern, and one of the many reasons I'm grateful for my North Carolina roots! If you've never had Hot Crackers before, here's the basic idea: you begin by creating a "marinade" of oil, crushed red peppers, and dry ranch seasoning. Soak the crackers for a few hours in this marinade. It soaks all the goodness right up, and voila! Hot Crackers. Blissfully flavorful with a little kick. Whisk together the oil, seasoning, and red pepper flakes. In a large bowl*, pour the oil mixture over the crackers. Use a rubber spatula to stir for 10-15 minutes to thoroughly coat the crackers and allow the oil to soak in. You could eat these immediately, but they are so much better if you'll allow a few hours for the oil to soak all the way in. I like them best next day. *Alternatively, you can pour all the ingredients into a bag and shake.